United has been the best-performing major airline stock of 2018, while JetBlue has been one of the worst. But both carriers raised their third-quarter unit revenue forecasts on Wednesday. Fuel prices have surged over the past year, making it critical for airlines to grow revenue per available seat mile (RASM) to offset their higher costs. Fortunately, the U.S. economy is very strong right now, which should make it easier to boost fares. Yet pockets of overcapacity have led to mixed unit revenue results across the airline industry this year. 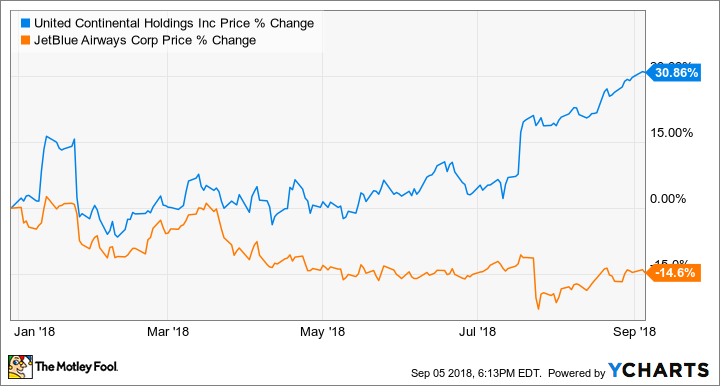 United Continental (NASDAQ:UAL) has been one of the biggest outperformers year to date, giving investors more confidence in its aggressive growth strategy. Meanwhile, JetBlue Airways (NASDAQ:JBLU) has been a laggard. As a result, United Continental shares have soared more than 30% since the beginning of 2018, while JetBlue stock has plunged by about 15%. United Continental vs. JetBlue Airways Year-to-Date Stock Performance, data by YCharts. However, both carriers had good news to report this week. At an investor conference on Wednesday, JetBlue and United modestly increased their Q3 unit revenue forecasts. United Airlines has posted solid unit revenue growth this year. Its strategy to regain market share by adding service in smaller cities and expanding in its big mid-continent hubs seems to be paying off. In the first half of 2018, RASM rose 3.1%. Entering the third quarter, management expected the good times to continue. United's initial guidance called for passenger unit revenue to rise 4% to 6% this quarter. JetBlue hasn't been so fortunate. While the company has been expanding its popular Mint premium service, it hasn't been enough to offset overcapacity in various markets and a bumpy transition to a new platform for vacation sales. As a result, RASM rose only 2.2% in the first half of 2018. Moreover, management gave a disappointing forecast for the third quarter in late July, calling for RASM growth of just 0% to 3%. JetBlue's unit revenue growth has been disappointing lately. Image source: JetBlue Airways. Demand trends have continued to improve over the past month and a half. Meanwhile, airlines are starting to reduce their capacity growth plans in order to shore up unit revenue, given that jet fuel prices are just shy of a four-year high. As a result, JetBlue and United now expect slightly better unit revenue performance than they had previously projected. On Wednesday, United revealed that unit revenue growth is likely to be near the high end of its forecast range for the third quarter (i.e., 6%). JetBlue increased the low end of its guidance range for RASM growth from 0% to 1% while maintaining the high end of the range at 3%. At first glance, it may seem like JetBlue is struggling mightily while United Airlines is cruising along. That's certainly what most investors seem to think, based on the two airlines' year-to-date share price performances. However, JetBlue's adjusted pre-tax margin was still higher than United's in the first half of 2018 (7.3%, compared with 6.6% for United). The two carriers' current forecasts imply that they will achieve relatively similar pre-tax margins in the third quarter. Furthermore, while unit revenue growth is on pace to be about 4 percentage points higher at United than at JetBlue this quarter, that's purely due to United's easy year-over-year comparison. Pricing missteps and the impact of Hurricane Harvey caused RASM to sink 3.2% at United Airlines in the third quarter of 2017. JetBlue's RASM increased 0.9% during the same period. United Airlines certainly has strong unit revenue momentum. Yet its plan to significantly increase capacity during off-peak periods this fall could slow its unit revenue momentum going forward -- although there will be offsetting unit cost benefits. On the flip side, JetBlue's unit revenue growth could accelerate in the next few quarters thanks to easy comparisons, recently implemented capacity cuts, and ancillary revenue initiatives. For now, United Continental seems to be investors' favorite. But in the fast-moving airline industry, it will have to work hard to maintain that status.